SO, YOUR CHURCH HURT YOU; NOW WHAT? It happens. Sometimes a church can seriously hurt one of its members. Many of us have felt the sting of a church that, in its own best interest, brought harm to us personally. I often hear stories from people who have felt the pain of a church that mistreated them in some way. So what should you do when you feel your church has hurt you? Allow me to share some suggestions. 1. Remember that churches are made up of people and people are sinners. Don’t expect too much from people in churches. You will be devastated if you set your expectations too high or place your confidence in man. People will fail you. A church is made up of saved sinners. Yes, they are God’s children, but they are still children. Dogs bark, cats meow, and sinners sin. The reason the churches mentioned in the Bible do not exist today and the gates of Hell did prevail against them is because a local church is made up of saved sinners. When sin rules death occurs. Never be surprised at what people do. 2. Remember that sometimes people do what is in their best interest not in the best interest of others. Don’t look so pious. We have all been guilty of making decisions which were not in the best interest of others, but were in our own best interest. Many people are hurt because churches make a decision based upon what is best for the church not what is best for the individuals in the church. The whole purpose of church is to work with the fallen. When we become more concerned about what is best for the whole and not the individual, we forgo the very definition of being a Christian. 3. Accept the fact that pastors make mistakes. I understand that pastors are held to very high expectations. Regardless of that fact, pastors are merely human, and they do make mistakes. Give them some room for mistakes. That does not mean that the hurt is not real, nor does it mean that you should not feel some pain when a pastor has hurt you. However, accept the fact that he is going to make mistakes and some will be hurt by his mistakes. This time it just so happened to be you. 4. Do your best to deal with the mistake in a Scriptural manner. Sadly, churches are often given a free pass when they mistreat members. However, all you can do is try to hold to a scriptural position and ask the church to do the same. If Matthew 18 was practiced more diligently, there would be fewer problems in our churches. Unfortunately, churches sometimes hold themselves above Scripture when it comes to dealing with people. It can become a public lynching without the accused being able to answer his accuser. Even a murderer gets his day in court. Just because it is a church does not make her immune to Biblical steps required by God Himself. 5. Do not get bitter. I understand that there will be emotions in play when the church has hurt you. Your feelings will be hurt. There will be angry. There will be grief. There will be sadness. Eventually you will go through all of these emotions, but if you do not react improperly, you will be fine. Whatever you do avoid bitterness by learning something from the situation that will make you better instead of bitter. 6. Do not look for others who have also been hurt. This is very dangerous. Birds of a feather flock together. Many times those who have been hurt in their church band together and revenge becomes a cause to them. 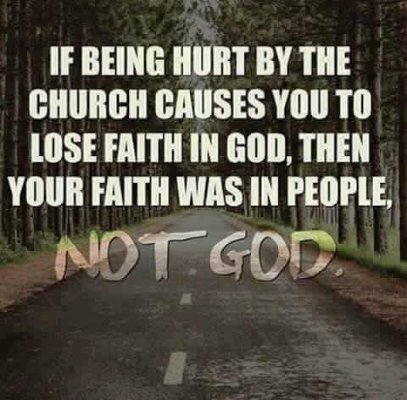 There are Internet sites dedicated to hurting churches who have hurt members. The cause of Christ is bigger than that. Do not make vengeance and revenge your cause. The best way is to avoid banding together with others seeking comfort from their hurt. Trust me, you won’t find comfort. You will find a mob mentality that is seeking revenge. 7. If you cannot find resolution for what has been done, leave quietly. Sometimes that’s the hardest thing to do. There’s two difficulties in this point. Do not leave without giving the pastor opportunity to make the wrong right. Leaving quietly does not mean leaving the pastor wondering what was wrong. Giving him opportunity to make it right is important. First, leaving can hurt. You leave behind friends. You leave behind memories. Sometimes you leave behind the place where you were saved or where your children were married. Perhaps you may even leave behind a place where you ministered in a position, even as pastor. Leaving is hard. The second difficulty is leaving quietly. There are many people who can leave easily. Their problem is they cannot leave quietly. They want everyone to know what was done to them. They want to find someone to blame for leaving. It’s not worth it, my friend. Just leave quietly and let it go. That leads me to the next point. 8. Let it go. “How?” you ask. By giving it over to the Lord. That is the only way you can let it go. Take your burden AND your hurt to the Lord and leave it there. Do not carry this burden by yourself because you will drop it. Let God have this burden, so that you can let go of the hurt inside of you. I know people who have carried hurt to their grave because of something a church did that hurt them. That’s a sad way to live your life. 9. Be kind to the members on an individual basis. When you see someone from the church, don’t hold them responsible for your hurt. They may not even know the entire story. In fact, they probably do not, and they do not need to know. Just be kind to them. If they ask questions, graciously shrug the questions off. 10. Don’t let it affect your family. My friends, this is huge. Your children could permanently be damaged by your attitude. Do not let your children lose confidence in the church. Many a child has permanently quit church because they were made aware of the hurt a church inflicted on their parents. I am not saying that you should not talk to them about it. They are not stupid. Children feel things and perceive much more than we sometimes give them credit for. What I am saying is talk to them and help them to get through it without becoming bitter and losing their confidence. Is it really worth it to lose your children and grandchildren because you are angry at being hurt? I don’t think it is. If your family chooses to join with the church against you then accept it to be so. God is the only one you can turn to in a time like this. There is no way to explain your side to the satisfaction of those who choose the other side. Keep giving the Gospel to those who are unsaved. There is no reason for the lost to go to Hell because you feel betrayed. If you are going to Heaven when you die you do not have a real problem. It is the people going to Hell who have the real problem. 11. Find a church and settle in again. Let me share with you a danger. Statistics tell us that in the U.S. 50% percent of first marriages end in divorce. However, the same study also shows that 67% of second, and 73% of third marriages end in divorce. Why is that? Because they are still carrying the baggage of hurt and anger from the previous marriage. The same is true about someone who has been hurt by a church. They go from church to church with suspicion and doubt because of the hurt they felt previously. My friend, do not allow that to happen to you. When you find a new church, focus on the new church not on your hurt from the previous church. Forgetting those things which are behind would be applicable in this situation. 12. In some cases it might be wise to explain to your new pastor what happened in your past church. Let me warn you. Do not accuse or blame your former church. It is possible you made mistakes, too. Perhaps you did something wrong that caused the church to mishandle you. They may have reacted wrongly to something you did wrong. Don’t focus on their mishandling of your mistakes. Tell the pastor the story as dispassionately as possible and then take his advice. Be wise enough to understand that you do not need an ally in a battle against a former church. You need a pastor who will shepherd you in your present life. Don’t try to turn him against the former church. That will eventually backfire. 13. By all means stay very close to God during this time. Stay in the Word. Stay on your knees. Stay faithful in all areas of ministry. Do not allow your relationship with God to be hindered because of the hurt brought upon you by a church. None of the things that I have shared with you here are easy. We are humans. When we hurt we tend to react rather than act. Responses are principled while reactions are emotional. Guard yourself. Do not make the mistake of destroying the blessings of God in your life because you become vindictive and hateful. As in everything, remember that God has a purpose for all things even before they ever happen. Maybe God wanted to move you on to a different place. Maybe God has a work for you that you could not have done in your former church, or perhaps God is trying to teach you something to help make you more useful in His service. Trust Him. Do not allow what God meant for good to be destroyed because of what was done to hurt you. May God give us grace in all areas of our lives, especially when we feel that we’ve been hurt by our church.